You've got most of your training behind you. You're fit and excited for your upcoming race. But one thing remains to be done to make sure you arrive at the starting line in the best form you possibly can. Tapering for triathlon is not an easy thing to get right. But if you do get it right, it can make a big difference in your performance on race day. This article is your definite guide to getting the triathlon taper right. The taper tactics I share with you here are all backed by science and by what the best athletes and coaches in the sport are actually doing. What​ is a "taper" anyway? Let's start by defining the taper. What does tapering for triathlons, or any race or event for that matter, actually mean? 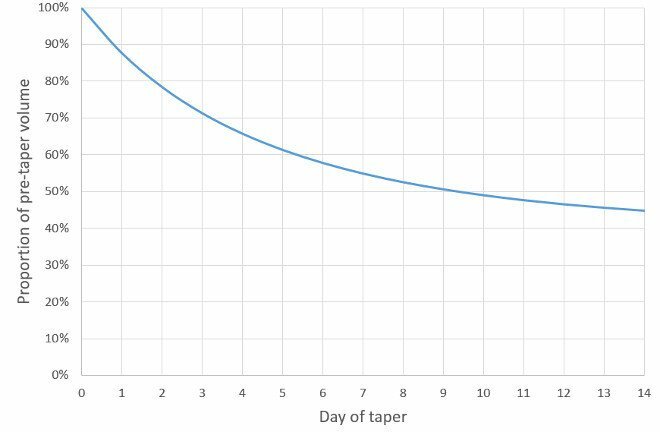 A taper is a planned, progressive reduction in training load to allow for peak performance, following a period of high training load. As training load decreases, so does fatigue, and when fatigue decreases, but fitness is maintained, a peak is achieved. A "typical" taper would be to start reducing training volume quite sharply two weeks before a goal race, and progressively decrease the training volume over the course of the taper period. More on that in a minute. Notice the close relation between tapering and peaking. Tapering is what allows you to achieve peak performance on race day. That's why sometimes the words "tapering" and "peaking" are even used interchangeably. What​ are the benefits of tapering? Before you can be bothered to start thinking about tapering, you'll probably want to know how it can benefit you. Multiple studies (see review articles here and here) have found that the expected performance improvement resulting from tapering is 2-3%, but there is a larger range of results from 0.5% all the way up to 8% (in cycling only). If you think that 2-3% doesn't sound like much, you may or may not be right, depending on your goals. You don't need to taper if you're doing your first triathlon, your goal is just to finish, and you have been training conservatively so you don't carry a lot of fatigue from training. On the other hand, if you look to set a new personal best, or just want to make sure you have the best performance you can on the day, tapering for your race is non-negotiable. Let's say you're trying to go under 6 hours for a half Ironman - if you get the 3% expected improvement from a well-executed taper, that's over 5 minutes off from your time. This could very well make or break your sub-6 hour attempt. The thing that makes tapering so difficult is that it's such a delicate balancing act. You need to reduce your training load appropriately to reap the benefits from reduced fatigue, but without losing fitness in the process (or at least minimize loss of fitness). In designing your perfect taper, there are four variables you need to balance; taper duration, training volume, training frequency, and training intensity. Let's go through what best practices and scientific research says about each of these. There is strong evidence that the optimal duration of a taper is 8-14 days. This comes from a meta-analysis of 27 studies on tapering in swimming, biking and running. The 8-14 days was found to be the optimal duration both when all disciplines were analyzed together, and in each of the three disciplines individually. In practice, the 8 days at the lower end of the range would be a good starting point for tapering for sprint-distance triathlons. 10 days or so could be used as a rough guideline for Olympic distance tapering, and 14 days is standard practice for tapering for half or full distance Ironmans. The same meta-analysis found that a 40-60% reduction in overall training volume compared to pre-taper volume is the optimal amount. That said, there is some evidence indicating that for triathletes, the reduction in run volume should be kept at a lower 20-40%. This would then be compensated by slightly higher reductions in swimming and cycling training volume. It's too early to go out and state for a fact that this is something all triathletes should do in their taper, and it's not something that could be considered standard practice either. However, it could definitely be worth experimenting with if you're really looking for the optimal triathlon taper. How should you go about reducing the volume of your training then? Reduce it in one go to a lower level, or progressively decrease it? Research has shown that the answer is the latter. But not only that - the shape of the progressive volume reduction shouldn’t be linear, but rather have a fast exponential decay shape, as seen below. The shape of volume reduction during your taper should have roughly this exponential decay shape (see this study, and thi﻿s). Obviously, it isn’t feasible or even desirable to follow these exact percentages, and you don’t have to decrease the volume every single day. Just make sure you keep reducing your volume when considering the average of a few consecutive days, and stick to the concept of a rather sharp decrease at the beginning of the taper, which levels out more and more as the taper progresses. Generally, it's a good idea not to reduce training frequency too much, if at all. In swimming particularly, but to a certain degree in running as well, it’s very important to keep the “feel” for the sport and keep the movement patterns ingrained in the muscle memory. To maintain efficiency in performing the movement patterns, frequent training in these disciplines is the best way to go. To reduce training volume, reduce the duration of the workouts rather than frequency. If you do reduce training frequency, don't reduce it by more than about 20% (as found in these two studies: study 1, study 2). Finally, although it’s very common for triathletes to believe that a taper should consist of reductions in both volume and intensity, this is definitely not the case. Although the absolute amount of intensity decreases, the proportion of your training that is done at a higher intensity should stay roughly the same as pre-taper. Again, this way of tapering has been tried and tested for a long time, and there’s plenty of research backing it up, including the meta-analysis and direct comparisons of high-intensity tapers with low-intensity tapers (see here, here and here). There's no available scientific research on how to taper for very long events, like the Ironman, and even 70.3s (half Ironman). It's quite common to apply longer tapers (like 3 weeks) to make sure that the chronic training load and fatigue of athletes with high training volume decreases sufficiently, but another school of thought is that the distance of the event doesn’t really make a big difference since the taper is relative to the preceding training. Ultimately, this is where the coach or the self-coached athlete needs to take an individualized decision based on experience. Through advanced modeling of training load, validated in elite athletes, it has been shown (links here and here) that reaching an ultimate performance peak more than once during a season is almost impossible since the reduced training load during taper negatively affects the fitness that can be achieved for subsequent events. In practice, it usually comes down to a choice between peaking for multiple races (typical for sprint to Olympic distance triathletes) at a level just below one’s ultimate performance peak, or peaking for just one main event (common for Ironman, and sometimes 70.3 triathletes) and sacrificing optimal performance in other races. As all things in training, each individual responds differently to different taper plans. There isn’t any single, correct taper recipe. Taper between 8-14 days, depending on race distance (possibly longer for Ironman races). Reduce your training volume by about 40-60% compared to pre-taper, with a steep reduction at the beginning of the taper that levels out as the taper progresses. Reduce your training frequency minimally (by 20% or less), if at all. Keep about the same proportion of intense training as you did before taper. A final consideration is that the more ambitious the goal, the smaller the margin for detraining, so it becomes increasingly challenging to design the perfect taper. This means that if you're just starting out, you'll be fine by following this article directly. But if you're trying to win a competitive race, you really need to nail down your taper perfectly. Very rarely will you get it completely right the first time, so all you can do is use each taper as an experiment and try to make small improvements each and every time. I hope you found some useful tips on optimizing your taper in this article. Don't hesitate to ask for clarifications and more details in the comments below, and if you did find value in the post, please take a second to share the post with friends or on social media! Glad you found it helpful Melinda! I took notes and am looking forward to reading the attached articles, as well. Can you give some concrete examples of the last principle? re: Keep about the same proportion of intense training as you did before taper. I’m trying to wrap my head around this.